You are here: Home / News / Happy Independence Day! 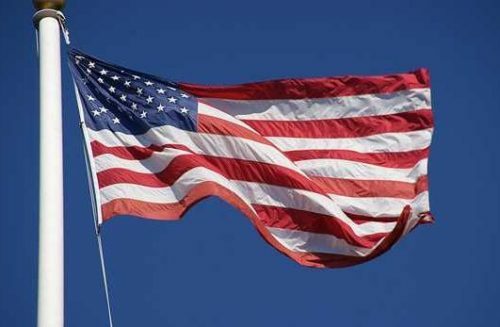 The American flag today, has gone through several additions as we achieved our 50-State union (photo from free photo.com). Happy Independence Day BlueSheepDog readers! Today is July 4th, and our country is turning 240 years old today. In the history of mankind no other nation has advanced so quickly as the United States of America. From rough, and rural colonies, to 50 united states, America has not only transformed itself, but the world along with it. The BlueSheepDog Crew hope all of our readers and fans enjoy the national holiday and have an opportunity to spend time with family while reflecting on the freedoms we often take for granted. We hope you will remember there are men and women in our nation’s uniform serving overseas to combat the threat of terrorism. Take time this holiday to investigate the steps our Founders took to establish “the land of the free and the home of the brave”. One of the original Declarations of Independence (photo by loc.gov). On July 4, 1776 the majority of the 2nd Continental Congress gathered in Philadelphia, Pennsylvania and voted to approve the Declaration of Independence written by John Hancock with the assistance of several others. Representatives from all 13 colonies approved this action. It would not be until August 2, 1776 that Congress would come together again to sign the Declaration. The chief author, John Hancock, was so adamant about his beliefs that he signed his name over twice as large as any other signatory. The act of approving the Declaration made the decision to separate from England official. This was in essence a declaration of war, because the Founders were well aware King George would not simply allow the American colonies to leave British rule. The signers of that document understood so much greater than we do, that their actions would be considered treason to the crown of England, and would subsequently place a death sentence upon them. Freedom is not free! The Declaration of Independence would seal an 8-year war with England where the fate of America and the world rest in the balance. Would monarchies continue to dominate the masses, or could the people rise up and throw off their masters to rule themselves. Though information was much slower to be passed along in the 18th century, the world anxiously awaited to see if America could succeed. 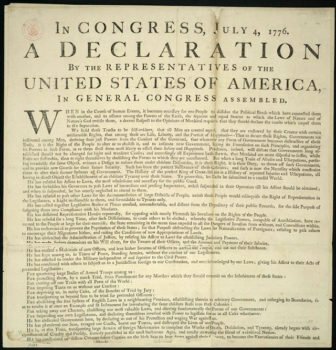 In fact, several of the signers of the Declaration of Independence would lose all of their earthly possessions as a result of the following war. Several were taken prisoner, nearly a dozen saw their homes ransacked and burned, and at least one suffered the loss of son in the battle of freedom. In fact, hostilities had already erupted between British troops and Colonial militia. The Boston Massacre had occurred six years earlier in 1770 when British troops fired on unarmed American protestors, killing 5 and wounding 6 others. The Boston Tea Party would take place 3 years later, in 1773, as the Crown continued to pass onerous taxes (called the Intolerable Acts) on just about everything Americans desired or needed. These high taxes, and an increased heavy-handed use of British troops, causes freedom-loving Americans to push back even harder. In 1775 British troops secretly set out from Boston to capture armories and stores of supplies in Concord and Lexington, Massachusetts. This movement was broadcast by Paul Revere’s famous ride and signal, alerting Massachusetts “Minutemen” to form up to repel the British. Re-enactors prepare for the Battle of Lexington photo from YouTube). The first shots rang out right at dawn, in what Ralph Waldo Emerson famously called “the shot heard round the world”. British reinforcements arrived, and the militia retreated to Concord, where the colonials had stored a large amount of firearms, ammunition, and powder. 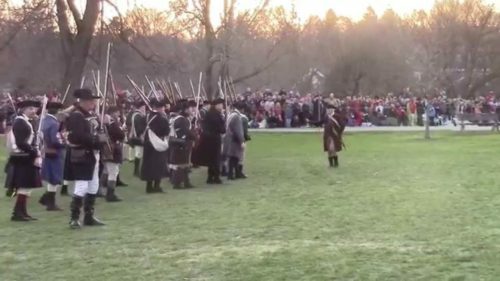 When the British arrived in Concord they were now facing around 400 militia. The militia fired first this time, and the outnumbered lead element of the British forces quickly retreated. As the British marched back to Boston the colonial militia harassed them along the entire route. What had been only a few casualties in Lexington and Concord, turned into 73 killed, almost 200 wounded, and over 50 missing British troops. The Continental militia would lose half as many. The actions of a few brave Americans sent terrifying ripples among the entire world’s monarchies. Could the people stand against the Crown and be successful? The next few years would be some of the darkest in American history, has General George Washington desperately tried to keep a rag-tag army together, and suffered many losses. The Continental Army crossing the Delaware (photo from YouTube). 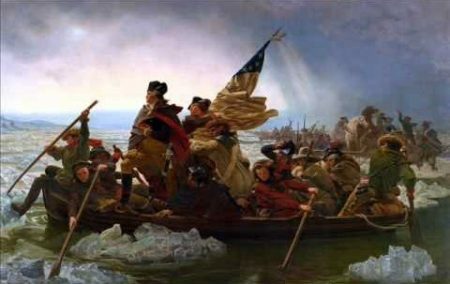 Many historians believe if Washington had not crossed the Delaware River on Christmas Eve, 1776, and successfully routed a mercenary Hessian force in Trenton, New Jersey, that the whole war effort would have collapsed as enlistments expired January 1, 1777. Instead, the incredible victory bolstered American spirits and many signed on to continue the battle. Seven long years later America would be a new and independent country. A country designed to have government “of the people and for the people”. Though often referred to as the “Revolutionary War”, I prefer to describe America’s first war in its proper context, “The War for Independence”. The first name implies the British were in the right, where the second rightly exposes the just cause of the American colonies. Take time to study our history, the good and the bad, during this national holiday. Though there are many pointing out the flaws that flow from our Republic’s form of government, there are many inspiring facts that highlight the desires of free men to live free, at whatever the cost!